For the first time in their lives, Coast Guard families are visiting Seattle-area food banks to make ends meet as the government shutdown enters its 35th day. It has come to this: People are selling containers of motor oil from their garage shelves. The treadmills they got for Christmas. The cars that they used to ferry their kids around, but can no longer afford to fill with gas. And, for the first time in their lives, Coast Guard families are visiting local food banks to make ends meet as the government shutdown enters its 35th day. The shelves of one food bank on the waterfront have been emptied every day, within hours of the doors opening. Some people drove 90 minutes to get there. Deltorres is the wife of Ryan Deltorres, a chief petty officer and one of the 3,000 active-duty and reserve members of the Coast Guard in the Northwest. 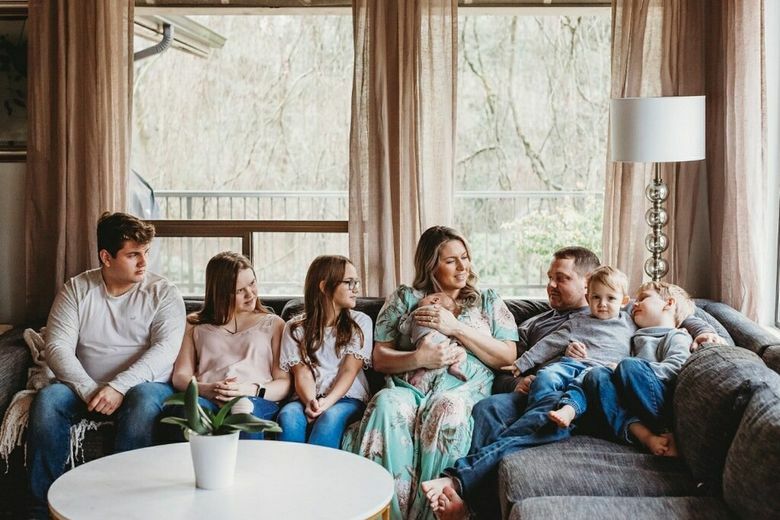 He has been in the Coast Guard for 17 years and was deployed to the Persian Gulf in November, leaving her alone with six kids — one of them a weeks-old baby. “We have always supported ourselves,” Alisha Deltorres said. “We have never needed assistance like this. We have prided ourselves with never needing help from anyone. Everything we have, we’ve earned. She had just unpacked the bags from the Seattle Coast Guard station food bank when I called. Canned food. Powdered potatoes. Some bread. Diapers and wipes for the baby. Food for the family dog. With what she had left in the freezer and pantry, she would be able to cobble together some decent meals. There’s more coming, as a woman named Mischelle Davis has been scrambling to organize — with the USO — a food drive to be held from 10 a.m. to 3 p.m. this Saturday at Fred Meyer stores in Maple Valley, Issaquah and Ballard. Former Seattle Seahawk Marcus Trufant will be at the Ballard drive to accept donations and greet fans. (Davis, who was one of the founding members of the Mothers Against Drunk Drivers Washington State Advisory Board, met Trufant at a Christmas party last month, and called him the other day, asking for help. “Whatever you need,” he told her). Davis has also helped to secure some $56,000 in donations, including $10,000 from the Windermere Foundation in matching contributions. “The members of the Coast Guard are the lowest-paid, least-respected members of the military, and it makes no sense,” Davis said. With our long coastline, “We are very vulnerable in Washington state, and these are the people who keep us safe. The food bank at the Seattle Coast Guard station serves members all over the state. Once that location’s supply is stable — and not getting cleaned out every day — the USO will use donated funds to set up smaller food banks, farther out, such as on the Olympic Peninsula. The shutdown came just as Alisha Deltorres was preparing to deliver her baby. She graduated from Bastyr University Medical School last year and, with the baby born, was preparing to take her state board exams and open her own integrative medical practice with money she had saved up. But that’s gone. She worries about her family, but more about those who don’t live near family, or whose only family is other, struggling Coast Guard members. And there’s this: Coast Guard retirees won’t be getting their pension checks at the end of this month. “That’s going to be a lot more people in a couple of weeks,” she said. In the meantime, her husband is still on the job, without pay. Nothing any of us can do. Except donate food this weekend. And pray for this misery to end.